Should the CEO report to a Chief HRO? Now there’s something to think about and to disrupt not only HR but business ideas in general! I recently watched a DISRUPTHR video by Kirsten Harcourt entitled “Why the CEO should report to the CHRO” – a real gem of a thought but in it she echo’s some of my passion about the struggle with HR departments. There have been numerous articles and blogs around the same topic in recent years but I’m not sure the message is getting through. Often, I still get the roll of the eyes when I ask people about their HR departments. This fact is simple and cannot be refuted – businesses cannot run without people – even in the digital age – there are people designing the apps and software that run the exponential growth of digital (a topic for another day!) And no, I won’t say that thing about “the most important asset” – yawn! BUT whether they or the companies they work for like it or not – they are without a doubt the largest stakeholders in their companies – and each other’s success is mutually bound (ooohh more topics)! People are needed and are important to your company – tick! Now let’s talk about the department that is tasked with sound people practices that help engage these stakeholders. HR departments are renowned for owning people administration but not many are renowned for their contribution to the strategic intent of the company and/or challenging the status quo or even having the credibility to do so. How do we change that? How do HR people gain credibility and become true strategic value add business partners? Let start with that stakeholder thing. HR people know HR stuff – they do not always know and understand the business and market stuff. As Kirsten Harcourt says – HR people need to have a deep enough understanding of the business and the market in which it operates. How on earth else can anyone contribute effectively to decision making? HR people need to get into the trenches, work with stakeholders, ask questions, develop understanding and dig harder than they do. This will go a long way to gain them credibility and trust as well as expand their knowledge. This will help them make better decisions for all the people practices that they are so passionate about like sourcing the right people, delivering the right employee skill development programs and designing the right engagement interventions – all to achieve the common goal of delivering the company strategy. Credibility and trust gained, informed decisions made, value add business partner – tick! In their pursuit for deeper understanding HR will also build strong internal relationships. But they must GET OUT FROM BEHIND THE DESK. Sorry – didn’t mean to shout but seriously – HR people are not data capturers or file maintenance clerks! They are business and people champions! They must get out there, talk to other stakeholders – find out what makes them mad, sad and glad (yes, I went there!). And then please HR people – don’t rush in to talk – saunter in with coffee to LISTEN and HEAR! Strong relationships and support base built, engagement started – tick! Now that they have a more than sound platform to work off, HR are better positioned to take some risks, challenge the status quo and bring in innovative ideas – AWESOME, now there’s some business value! I like what Kirsten says – get comfortable with being uncomfortable! This is where anyone will grow and if HR design their own learning around things NOT in their comfort zone their growth can be exponential. Then, can you imagine the influence that that example would have on the company training plan. I know it sounds daunting for HR people and idealistic for business – but it can and has happened. Companies need to push HR to deliver at a higher level and expect more from them. HR needs to up the ante and exceed expectations. Baby steps – start small but for heaven’s sake – START! And you can start here! If your business or HR department could use some out the box thinking or some sound HR basics, book here for a free session with us and will assess your HR department and/or your HR needs in general. 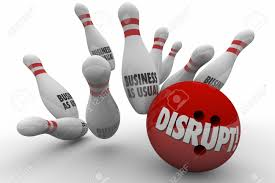 By the way DISRUPTHR is a wonderful movement in the USA that focuses on information exchange designed to energize, inform and empower people in the HR field. They have expanded into South Africa and have had an event in Cape Town already – go have a browse at https://disrupthr.co/ and you will find more gems!